Vehicle population is projected to grow close to 1300 million by the year 2030. A large amount of vehicle transportation relies on combustion of diesel, gasoline, jet fuels with large amount of emission of carbon monoxide (CO), Unburned hydrocarbons (HC), Nitrogen oxide (NOx) and particulate matters (PM) are specially concern. HC, CO occur because the combustion efficiency < 100%. The NOx is formed during the very high temperatures (>1500 C) of the combustion process resulting in thermal fixation of nitrogen in the air which forms NOx. Typical exhaust gases composition at the normal engine operating conditions are: Carbon monoxide (CO, 0.5 Vol. %), unburned Hydrocarbon (HC, 350vppm), Nitrogen Oxides (NOx, 900ppm), Hydrogen (H2, 0.17vol. %), Water (H2O,10 vol. %),Carbon dioxide( CO2, 10 vol.. %),Oxygen ( O2, 0.5 vol.%). Carbon monoxide is noted poison that has an affinity for Haemoglobin in the blood 210 times more than the Oxygen. The reduction of toxic substances emission from the combustion can be seen in the form of two measures: . Primary measures(Inside Engine): Here many different technical methods are used to reduce the exhaust emission i.e. Combustion of lean air fuel mixture, Exhaust gas recirculation etc. .Secondary measures Outside Cylinder): After the primary measures are used, there is an oxidation, reduction, and 3 way catalytic converter based on adsorption procedure. This enables the reduction of CO, HC, And NOx, that is Desirable. The catalytic converter was invented by Eugene Houdry, a French mechanical engineer and expert in catalytic oil refining, who moved to the United States in 1930. When the results of early studies of smog in Los Angeles were published, Houdry became concerned about the role of smoke stack exhaust and automobile exhaust in air pollution and founded a company called Oxy-Catalyst. Houdry first developed catalytic converters for smoke stacks called "cats" for short, and later developed catalytic converters for warehouse forklifts that used low grade, unleaded gasoline In the mid-1950s, he began research to develop catalytic converters for gasoline engines used on cars. He was awarded United States Patent 2,742,437 for his work. Widespread adoption of catalytic converters did not occur until more stringent emission control regulations forced the removal of the anti-knock agent tetraethyl lead from most types of gasoline. Lead is a "catalyst poison" and would effectively disable a catalytic converter by forming a coating on the catalyst's surface. Catalytic converters were further developed by a series of engineers including John J. Mooney and Carl D. Keith at the Engelhard Corporation, creating the first production catalytic converter in 1973.William C. Pfefferle developed a catalytic combustor for gas turbines in the early 1970s, allowing combustion without significant formation of nitrogen oxides and carbon monoxide. 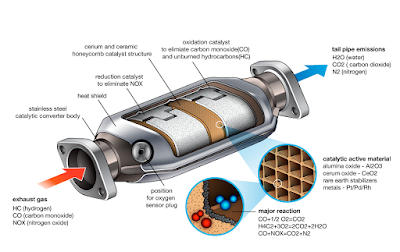 A Catalytic Converter is an emissions control device that converts Toxic gases and Pollutants in exhaust gases to less Toxic pollutants by catalyzing a Redox reaction (an oxidation and a reduction reaction). Catalytic converters are used with Internal Combustion Engine fueled by either petrol (Gasoline) or Diesel- including lean burn engines as well as Kerosene Heaters and Stoves. Position of Catalytic Converter Vehicle The Catalytic Converter is placed inside the tail pipe through which deadly exhaust gases containing unburntfuel, CO, NOx etc. are emitted. The function of the Catalytic Converter is to convert the pollutants into CO2, Water, N2, O2, These are less harmful gases. A mixture of residual quantity of HC, CO, NOx are left over after combustion, consequently, a Catalytic Converter uses precious metal like - Platinum( PT), Palladium ( PD)as a catalyst to convert harmful pollutants into less harmful gases like- CO2, O2, H2O etc. Although catalytic converters are most commonly applied to exhaust systems in automobiles, they are also used on electrical generators, forklifts, mining equipment, trucks, buses, locomotives and motorcycles. They are also used on some wood stoves to control emissions. This is usually in response to government regulation, either through direct environmental regulation or through health and safety regulations.